If you read my blog on Tuesday then you’ll know that I planted a double hedge in the front garden in North London. My client was a bit worried about box blight so we decided instead to use Ilex crenata (Japanese Holly) for the low hedge. It’s a great alternative to box (Buxus sempervirens) because it looks virtually identical, with small rounded glossy dark green leaves, and has a good neat habit which makes it ideal for clipping. 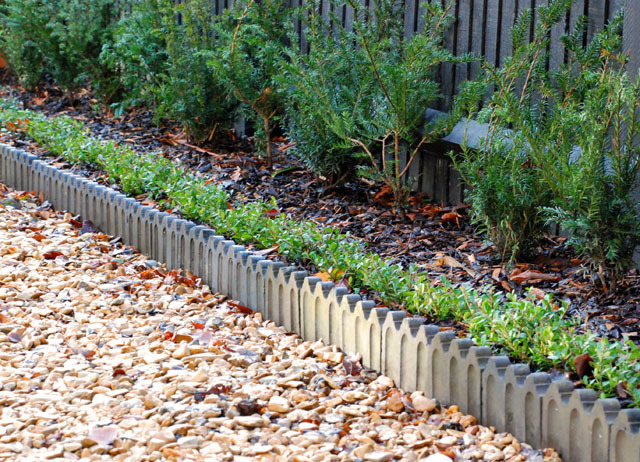 It can be used for formal hedges or topiarised shapes such as balls or pyramids, which means that you can achieve the same look and feel to a garden without the risk of blight. Box blight is a fungal disease which causes the leaves to go brown and drop and, as there’s no domestic treatment available, the only solution is to remove the infected plants. Ilex crenata is a bit more expensive than Box, but it’s becoming more widely grown now and if you’re happy to wait for the hedge to fill out then you can use smaller plants. If you want something a bit different, there’s also a golden variety called ‘Golden Gem’ which has yellow leaves.